Golf is a hugely popular sport. Despite the fact that it is considered a non-contact sport, golf can actually be very dangerous. Accidents involving errant golf balls and flying club heads are all-too-common, and can result in brain injuries, severe bodily harm, and in some cases, death. If you or a loved one has experienced a golf-related injury caused by the negligence of another party, we can help. Sports injury lawyer Edward Deason provides representation to clients in Torrance and surrounding areas. With nearly 30 years of legal experience, Mr. Deason and his dedicated team have the knowledge and training needed to help our clients receive the compensation they need to cope with the pain and suffering of an injury on the green. Contact the Law Offices of Edward Deason today to schedule a consultation with us. Our world-renowned golf courses draw thousands of visitors to California each year. Golf-related injuries are fairly common in the state, and may involve a fellow player, spectator, or golf club employee. When errant golf balls stray from their usual or intended path, they are capable of causing severe personal injury, and even death. Unfortunately, many of the people injured by errant golf balls each year are children. Serious head injuries can be especially life-threatening in children. Our team is dedicated to protecting the victims of these devastating injuries. 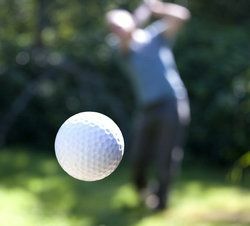 Demonstrating another party’s negligence in an errant golf ball case requires the assistance of a well-versed personal injury lawyer. In many sports injury cases, the law actually protects the person responsible for inflicting injury. This means that the injured party is expected to assume responsibility for any related losses or medical expenses. Fortunately, the Law Offices of Edward Deason are skilled in handling all types of sports injury cases, including those involving injury and trauma caused by errant golf balls. An unfortunate accident and an act of negligence that results in an accident are two hugely different situations. Our legal team will thoroughly evaluate your unique personal injury case to determine whether another party’s negligence may have resulted in your injury. For example, if a golfer makes a shot without giving proper warning, they may be liable for any injuries that occur as a result. Similarly, if a golf club does not properly enforce safety rules for its players, and an unannounced ball hits someone, the organization may be at fault. Edward Deason has the intimate knowledge needed to effectively navigate this complicated area of law, and in applicable cases, prove another party’s negligence. If you or a loved one has been a victim of an errant golf ball or other sports-related accident, you may be entitled to compensation. Contact the Law Offices of Edward Deason today. Our legal team is dedicated to helping you heal during this difficult time, and we will use our proficiency and expertise to provide you with the strongest personal injury representation available.